Dan Teager began studying the trumpet at the tender age of seven and now, a few decades later, he continues to be enthusiastic about the instrument and its capabilities. After graduating from Princeton University, he went on to study electronic music composition at NEC with Robert Ceely. 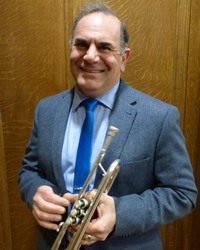 Teager was introduced as a young artist by the Armenian Renaissance Association in 1989, and has performed as a featured soloist in venues ranging from the Massachusetts State House to the historic 12th Baptist Church in Roxbury. Though primarily a trumpet player, he is known locally as a bandleader, songwriter, and arranger as well. As a teacher he has taught both trumpet and recorder to students as young as five, as established as eighty, and most ages in between. In 1996, he founded the 15-piece world music group, Black Sea Salsa, with the idea of creating an original sound by fusing elements of Middle Eastern music with Latin Jazz and blues. Since its first concert, the group has gone on to establish itself as one of Boston's premier festival bands, performing up and down the East Coast. Black Sea Salsa has recorded two CDs, and played at venues such as Boston Harborfest, Steppin' Out Boston, and Philadelphia's Arts on the Main Line. As its director, writer, and arranger, Teager has been recognized with awards from the Massachusetts Arts Council and the Armenian Foundation for Film Music and Art. In addition to teaching, freelance work, and Black Sea Salsa, Teager also directs the Youth Choir at the Holy Trinity Armenian Apostolic Church in Cambridge. As he tells all of his students: "they call it playing music for a good reason."